There was no particular change in the Ethernet header and the IP header at the time of the switching of Layer 2, but when the routing, both the header are rewritten. 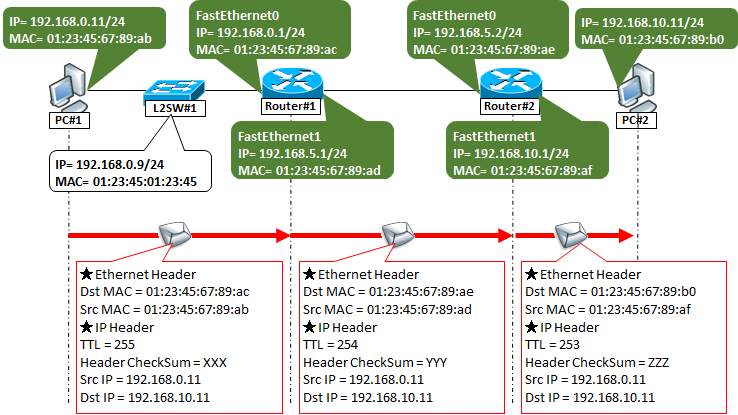 Specifically, the destination and source MAC addresses of the Ethernet header change. Also, the TTL (Time To Live) of the IP header Field is decremented by one, and also re-calculated checksum Field accordingly.※ source and destination IP addresses do not change. And, as is also the above figure, even if IP adress is assigned to L2 switch between PC and router, it does not influence the routing. It means, the behavior does not change whether L2SW is assigned IP address or not. Be careful thbt the destination MAC address of the Ethernet sent from the terminal 1 is not a L2 switch's but is router 1. Please refer to this idea .